In February I went a little crazy after seeing Ashish's Autumn Winter 2014 show in London. He had some pretty fantastic pieces on display, but there was one pair of jeans on show that I was sure we would be seeing again - the Vogue Jeans. Then the very next month, at the Vogue Fashion Festival in London, Karlie Kloss walked onto stage wearing the aforementioned jeans. 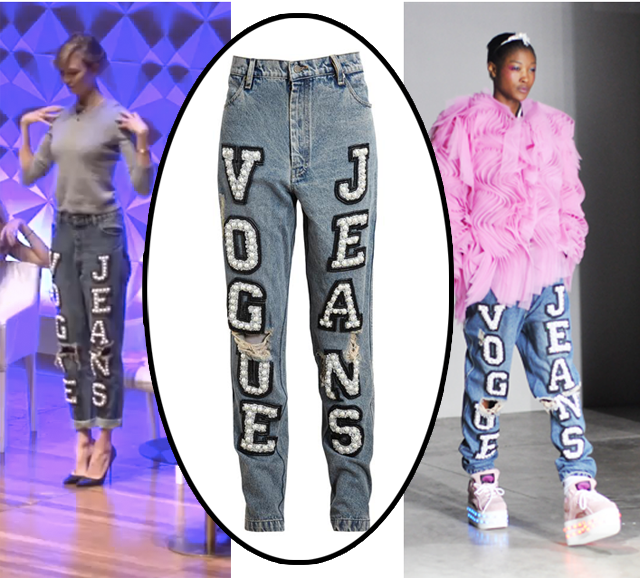 The Vogue Jeans had found their perfect placement on one of the world's top models, in front of an audience of thousands. Kloss was officially the first to wear. Well, now the jeans are in stock at Browns and they have a price tag of £760. While I'd love to see them side walked styled, I'm still waiting for their Vogue print feature moment. Surely a September issue will feature these beauts? Fingers crossed!